Shop updates! Follower issue 2 is now available! We finally received the Chapter 2 books! They are now in the shop, along with tons of other new stuff we’ve added since the busiest part of our convention plans for this year are over for now. The print (and PDF) version of Chapter 2 includes an exclusive 7-page bonus story called “Standing With Victor,” which takes place surrounding the events at the news station in the beginning of the chapter. You can only see it by purchasing the book! Buying from our shop helps to support Follower and Messenger and keeps new comics coming every week for free. We couldn’t do what we do without all of you. New Patrons-only Content! The end of Chapter Two! Have you been waiting for the conclusion of chapter two? So have we! The last two pages of chapter two are now available to patrons at all pledge levels on Patreon! 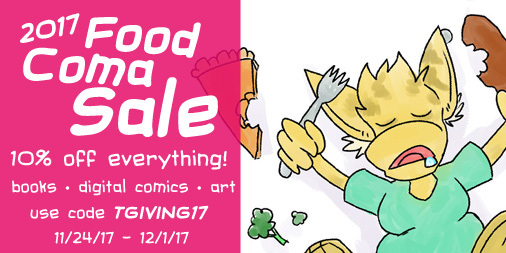 If you pledge as little as $1 today, you can get tomorrow’s page early and next week’s finale all at once! Supporting us through Patreon is a great way to help us get the word out about Follower and enable us to keep producing better and better comics, and all patrons get rewards for helping us out! If you enjoy reading Follower, please consider pledging today! The upcoming end of chapter two also means that PDF versions of the books will be available soon (most likely this week) and print copies a bit after that! Our shop will update with new stock after UBCon on April 17-19. If you’ll be in the Buffalo area that weekend, please drop in and say hello! We’ll be in the Artist’s Alley.